Do you want to know how to make a header in Excel? Or are you wondering how to add the footer page 1 to the current worksheet? This tutorial will teach you how to quickly insert one of the predefined headers and footers and how to create a custom one with your own text and graphics. To make your printed Excel documents look more stylish and professional, you can include a header or footer on each page of your worksheet. Generally, headers and footers contain basic information about the spreadsheet such as page number, current date, workbook name, file path, etc. Microsoft Excel provides a handful of predefined headers and footers to choose from, as well as allows creating your own ones. Headers and footers are displayed only on printed pages, in Print Preview and Page Layout view. In the normal worksheet view, they are not visible. Go to the Insert tab > Text group and click the Header & Footer button. This will switch the worksheet to Page Layout view. If you wish the header to appear in the top left or top right corner of the page, click the left or right box and enter some information there. When finished, click anywhere in the worksheet to leave the header area. To exit the header box without keeping the changes, press Esc. When you print out your worksheet, the header will be repeated on each page. On the Insert tab, in the Text group and click the Header & Footer button. On the Design tab, click Go to Footer or scroll down to the footer boxes at the bottom of the page. Depending on the desired location, click the left, center, or right footer box, and type some text or insert the element you want. To add a preset footer, please follow these steps, to make a custom Excel footer, see these guidelines. When done, click anywhere in the worksheet to exit the footer area. For example, to insert page numbers at the bottom of the worksheet, select one of the footer boxes and click Page Number on the Design tab, in the Header & Footer group. On the Insert tab, in the Text group, click Header & Footer. This will display the worksheet in Page Layout view and get the Design tab to appear. On the Design tab, in the Header & Footer group, click the Header or Footer button, and select the built-in header or footer of your choosing. When inserting an inbuilt header or footer in Excel, please be aware of the following caveats. 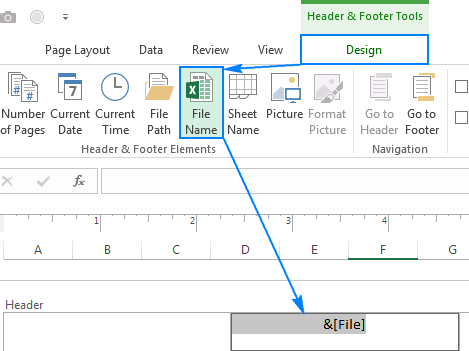 Most of the preset headers and footers in Excel are entered as codes, which makes them dynamic - meaning your header or footer will change to reflect the latest changes you make to the worksheet. When adding a built-in header or footer, you cannot control the location of specific elements - they are inserted in the predefined boxes no matter which box (left, center, or right) is currently selected. To position the header or footer the way you want, you can move the inserted elements to other boxes by copying / pasting their codes or add each element individually as explained in the next section. In Excel worksheets, not only can you add preset headers and footers, but also make your own ones with custom text and images. As usual, you start by clicking the Header & Footer button on the Insert tab. Then, click one of the boxes at the top (header) or at the bottom (footer) of the worksheet and type your text there. You can also enter different pieces of information by selecting one of the built-in elements on the Design tab, in the Header & Footer Elements group. This example will show you how to create a custom header with your company logo, page numbers, file name and current date. As soon as you click anywhere outside the header box, an actual picture will show up. Our custom Excel header looks pretty nice, don't you think? To start a new line in a header or footer box, press the Enter key. To include an ampersand (&) in the text, type two ampersand characters without spaces. For example, to include Products & Services in the header or footer, you type Products && Services. 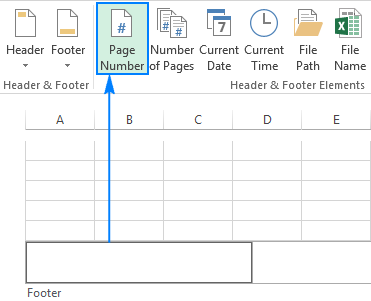 To add page numbers to Excel headers and footers, insert the &[Page] code in combination with any text you want. For this, use the built-in Page Number element or one of the preset headers and footers. If you enter the numbers manually, you will end up having the same number on each page. If case you'd like to create a header or footer for chart sheets or for several worksheets at a time, the Page Setup dialog box is your option. Select one or more worksheets for which you'd like to make a header or footer. To select multiple sheets, hold down the Ctrl key while clicking the sheet tabs. Go to the Page Layout tab > Page Setup group and click the Dialog Box Launcher. The Page Setup dialog box will show up where you can select one of the preset headers and footers or make your own one. Click the Custom Header… or Custom Footer… button. Select the left, center or right section box, and then click one of the buttons above the sections. To find out exactly what element a particular button inserts, hover over it to display a tooltip. You can also type your own text in any section as well as edit or remove the existing text or codes. Tip. 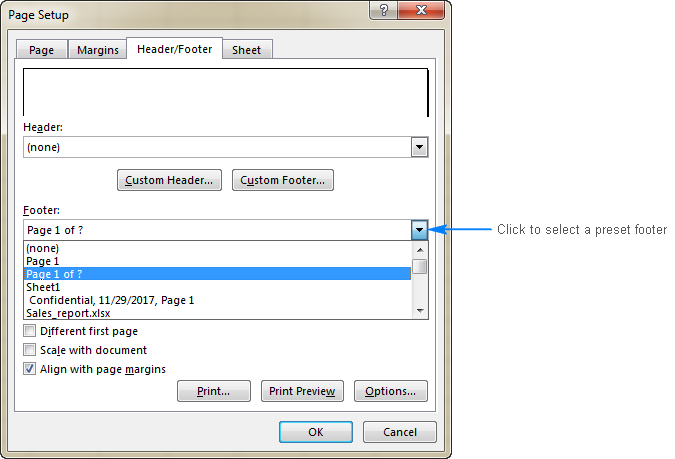 To see how your header or footer will look like on a printed page, click the Print Preview button. 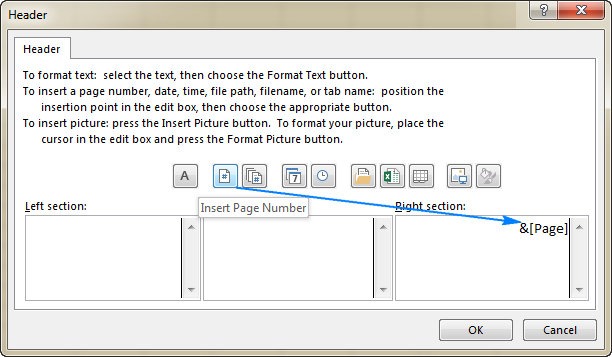 There are two ways to edit headers and footers in Excel - in Page Layout view and by using Page Setup dialog. To switch to Page Layout view, go to the View tab > Workbook Views group, and click Page Layout. Now, you select the header or footer text box and make the desired changes. 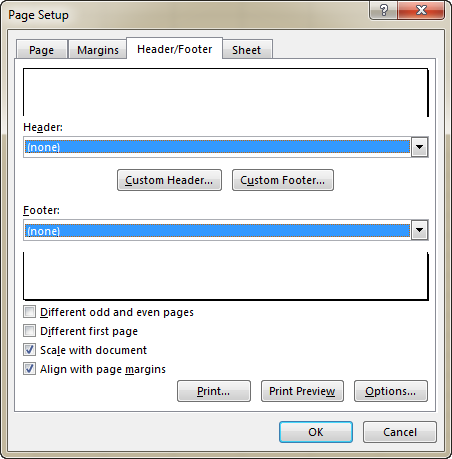 Another way to modify an Excel footer or header is by using the Page Setup dialog box. Please remember that a header and footer of chart sheets can only be edited in this way. On the View tab > Workbook Views group, click Normal. Or, just click the Normal button on the status bar. To remove an individual header or footer, simply switch to Page Layout view, click the header or footer text box, and press the Delete or Backspace key. Select the worksheets from which you want to remove a header or footer. Open the Page Setup dialog box (Page Layout tab > Page Setup group > Dialog Box Launcher). In the Page Setup dialog box, click the drop-down arrow to open the list of preset headers or footers, and select (none). That's it! All headers and footers in the selected sheets will be removed. Now that you know the essentials of Excel headers and footers, the below tips may help you avoid common challenges. To insert headers or footers on multiple worksheets at a time, select all target sheets, and then add a header or footer in the usual way. To select multiple adjacent worksheet, click the tab of the first sheet, hold down the Shift key, and click the tab of the last sheet. To select multiple non-adjacent sheets, hold down the Ctrl key while clicking the sheet tabs individually. To select all worksheets, right-click any sheet tab, and choose Select All Sheets from the context menu. Once the worksheets are selected, go to the Insert tab > Text group > Header & Footer and enter the header or footer information as you like. Or insert a header/footer via the Page Setup dialog. When finished, right click any unselected sheet to ungroup the worksheets. If all of the sheets are selected, click any sheet tab, and then click Ungroup Sheets in the context menu. Alternatively, select the header or footer text you want to change, head to the Home tab > Font group and select the formatting options you want. Change to Page Layout view. Select the header or footer. Go to the Design tab, and check the Different First Page box. Set up a special header or footer for the first page. Tip. If you want to create separate headers or footers for odd and even pages, select the Different Odd & Even Pages box, and enter different information on page 1 and page 2. To keep the font size of the header or footer text intact when the worksheet is scaled for printing, switch to Page Layout view, select the header or footer, go to the Design tab and clear the Scale with Document box. If you leave this checkbox selected, the header and footer font will scale with the worksheet. For example, the header text will become smaller when you select the Fit Sheet on One Page printing option. 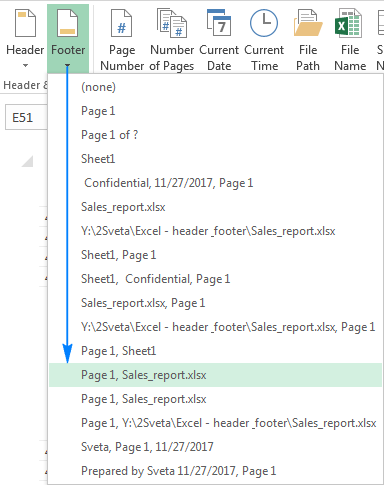 That's how you add, change and remove headers and footers in Excel. I thank you for reading and hope to see you on our blog next week. 12 Responses to "Header and footer in Excel: how to insert, edit and remove"
How do I display both the current date and the date of one week ago in the header? Your's was a very interesting question that I had never considered. Entering current date is easy and can be done in the print page setup. Entering current or other date info into a worksheet cell is pretty easy, but headers and footers are special cases. You might need to consider entering the past date into the worksheet in a cell located at the top of the page. How to add more than 3 columns in the predefined Header and footer section? I have gone through the article on Header and Footer. This is rather applicable to PC, etc. What about Android mobile device? I shall be pleased to receive guidance from you. Is there a way to change the picture dependant on a cell selection. The scenario we have employees select the brand/ customer they are working on from a drop cell, and it changes the picture in the footer. Right now we have to have multiple variants of the same spreadsheet which is tedious. Is there any way to purge the drop-down list containing previous footer history? I want to delete confidential info that was included in a prior footer. Thanks! Have you noticed that the text in the last footer text box is right adjusted AND at the bottom of the text box? Usually, this is what you want. For example, it is a great place to insert the "file name" when you are creating and printing multiple drafts of a spreadsheet. But sometimes, you want to insert text above the bottom line. There is a simple solution. Use Alt+Enter to insert a new line character in front of the text on the bottom line. This inserts a new line ABOVE the bottom line. If you want to use this trick, be sure to save your spreadsheet before you do. It is easy to mess up the format of the footer, and the easiest way to fix it is to exit the spreadsheet and load a new copy. I received an excel document when open it shows the file name OVERHAUL-ebc. The main file name is actually OVERHAUL, but I want to get rid of ebc cause this is the author's name or signature. Also it is affecting my other new open excel docs whereby it appears Book4-ebc.